Golden Technologies proudly presents one of the industry's finest standard lift chairs at an economical price! Compare our quality features and judge for yourself. The Capri Series is a two position chair which lifts and reclines to a semi "napper" position with arms that offer a wider, more rounded design for extra comfort and stability. 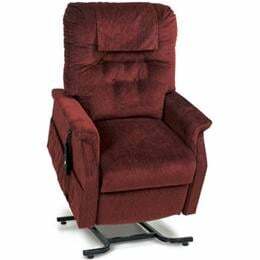 A truly sensible lift/recliner, the Capri combines dependability with long lasting comfort and style.